Just a OOC reminder.. this is OOC knowledge unless you hear about it IC some how. Also I am not a great writer but I'll do my best ! Entry 1 : A new life. I walked out of Jennison in search of something better. I wanted something better than what my father had provided. Our lives were pathetic. Having nobles look down upon us. We struggle to eat daily. We must wear the same clothes for years. Mother has gone on to be with the Gods. Lucky for her that she doesn't have to deal with this. I hate her for not having to deal with this as we do. She took her own life by hanging herself. Stupid coward. If she was here today I would remove her head with my bare hands. Save her the trouble. Before I left I stole every bit of coin my father had. Took what was left of the bread and cheeses. He would have to find some other way to feed himself and my young sister, Amberline. It is not my concern as I needed what he had to be sure I could begin my rise to respect in the world. Maybe now he will begin to understand that he is a failure as a father. Something I would never be. Letting others walk all over you. One day I will return and show him what a real man is. With the money I had taken I was able to buy myself a basic set of armor and a sword. I had learned to fight as a young child and through my teen years as all the young males did in case we were needed to defend the town. (( Kain is now 20 )) I ventured out of the town and quickly found the road to be guarded by goblins of all sorts. Some were on Worgs while others on Spiders. It was tough learning to fight enemies that really wanted to kill you. As the days progressed I met a woman on the roads while I was sitting at a camp fire having my dinner. She asked me what I desired in life. I explained that I wanted to be feared. That I wanted people to tremble at the mention of my name. I wanted glory. I wanted power but mostly I just wanted them to fear me. She revealed her self to be Empress Sekhmet and spoke of the Dark Queen, Takhisis. 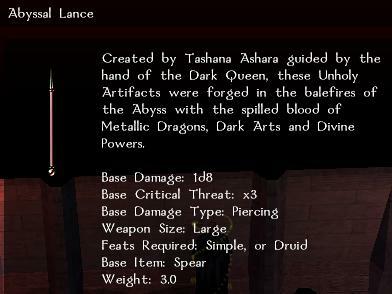 We then took a journey together where she presented me to her Dark Queen who accepted me into her DragonArmy. Oh the feelings I had. Tears almost came to my eyes as I realized I had finally found my path. The path that would lead me to power. To glory. The path that would make them all tremble when the name Kain Toloak was mentioned. I decided to go for a walk today. Much had happened recently with leaving my family and then finding myself as a member of the Dark Queen's army. My head swirled with visions of the weak falling to their knees when I walked near. The strong falling to the ground headless if they opposed me, blood running all about my feet. Krynn would be my playground and all that oppose me are merely toys of amusement until I grow bored of them. My day dreaming was interrupted by a whisper in my head telling me to do something for the Dark Queen. I was to find a Cleric of Mishakal and take what she was transporting. The voice told me to travel the roads to Tantalon. (( OOC : I believe that was the name of the city )) There I would find some ruins where she would be. Fortunately for me I knew where this was and made a quick journey there. As I approached the ruins I noticed a line of smoke coming from a small camp fire. I climbed a small hill and noticed a young lady, maybe 17 years in age, standing over a pot cooking her meal. I would describe her as beautiful. In any other time I would have considered her for a lover but there were more important matters at hand. She smiled as I approached and offered me something to eat. I politely declined and we talked a bit. She mentioned faith in Mishakal. I attempted to explain that her faith was misplaced. That she just didn't understand. Little did she realize she had already had her last meal. The battle wasn't easy. While I caught her by surprise she quickly recovered and began to unleash the power of her Goddess. I slammed my shield into her, knocking her from her feet. This is when I knew I had the fight won. As she went to get to her feet my blade hit its mark true and cleanly removed her head from her neck. I stood there a minute admiring my handy work as her head rolled to a stop several feet away. Quickly searching her body I found the item that she was transporting. I quickly put the item away and began my journey to the Temple. As I made my way to the altar, I was instructed to place the item on the ground and then watched as the item was destroyed. A warmth filled my body as I knew I had served my Queen well. She offered me a selection of a few women whom all appeared to be Clerics. I took a few moments and chose one who would be available to do my bidding. As I prepared to leave she approached me. She talked of being pleased with my work and my showing of loyalty. She then promoted me to Officer among her army. I fell to one knee.. I thought of the Cleric that I had killed. How I told her she didn't understand that her faith was misplaced.. Now you understand. Once again I was taking a walk when the whispers in my head began. She wanted to know how loyal I was. How important things such as friends, family, and loved ones were. My thoughts went to my father and my sister. I should have known she would know my thoughts. She told me to go to my home. I was to bring my sister to her and whatever happened with my father she did not care. I took a long time to make the journey home. There was no reason to rush. It seemed as though the walk lasted forever. I approached my father and sister who were standing just outside my former home. My father was his typical self. The pathetic man. My sister didn't understand what was going on. He tried to send her inside but I would have none of that. She needed to see what her brother was becoming. A real man. One who commanded respect. One who would take what he wanted when he wanted it. Then it came. The sword flashed with amazing quickness. Head was separated from body. I couldn't help but smile and laugh a bit. I kicked his head to the side so I could see it roll. Now you understand Father. Just like the cleric before you. I pulled my sister along while she cried. She kicked and screamed. Telling me how horrible I was but I knew I was doing what was best for her. I knew that this would give her the life she deserved. She is to young to understand now but in the future Amberline will thank me for bringing her to the Dark Queen. Once we entered the Temple I felt more alive than ever. I had shown the Dark Queen my loyalty was truly to her. I tossed my sister in front of her. After a bit of talking it was decided I would take her below to the torture chambers. She needed to be broken or die. I had no intentions of seeing my sister dead nor not pleasing my Queen. Amberline would be broken and would submit to the will of Takhisis. The voice. Is it always there.. knowing all that I do? Today while I was relaxing and enjoying the carnage from a recent butchering of mine , yes I had chopped another man's head off, the voice came back. I was to meet a man and together we were to bring her a Pure Blood. I wasn't sure exactly what she meant so I would have to rely upon the companion she had picked for me. I ventured upon a man who wore a uniform that was similar to mine with the exception that his was colored red. Obviously he was a member of her army yet aligned with the red dragons. Immediately I gave the man respect as we all know the Reds are the most powerful of the dragon kind. I found his name to be Nevine. He was a well spoken man who was quite the opposite of me. I think we will make a good team. We walked, talking very little. I suspect that he was focused on the task at hand as much as I was. After walking for a time we came across a camp with two elves. A young lady and a man, both elves. The man was obviously a protector and guide of sorts. Immediately he locked eyes with me and my drawn blade. It was obvious to me right then that this elves head would soon be removed from his body. The woman obviously was the pure blood that we were sent to capture. We conversed a bit though I gave way to Nevine to handle the conversation as I prefer just to kill and ask questions later. As I said, we will make a good team in service to her. He talked our way into venturing forth with them. They were going to a place where we might have seen Darconians the woman had said. Though I can't remember now where they were headed because all I could think about was how I was going to kill the male elf. The blood lust was being to surge inside of me. We walked for a bit and then the tensions started to pick up between the male and myself. Comments were tossed back and forth eventually leading to a challenge. The fight wasn't easy. Eventually I broke through his defenses and was able to strike a strong blow to his side. I heard the crunching of bone. At that moment his guard dropped to one knee. The opening was there and with that his head was removed from his body.. Now he understands. Nevine quickly moved into action and knocked out the female , the pure blood. We made our way to the Temple where Nevine had the honor of sacrificing her. I would have liked to have done it myself but Nevine didn't have the fun of killing the male elf. We had pleased her. For that we were rewarded, being promoted to Commanders in her Army. Life is good.. more heads will roll soon. It seems to be the same thing every day lately. Restless nights and days that begin with the trips down to the dungeon to visit my sister. Her spirit is beginning to break. A little bit each day you can see her giving in and starting to understand that her path in life leads her to the service of the Dark Queen. The hatred she had shown for me has left her eyes. No longer does she curse and spit at me. She even cracks a slight smile from time to time when I tell her of the power she can't even imagine. Things are progressing well I think. I returned to my chambers for a relaxing evening in front of the fireplace. I was reviewing some reports of the men that I command when there was a knock on my door. Not a very common thing so I figured something was important. Upon opening the door there stood a beautiful young lady. A Priestess of the Dark Queen. She carried with her a large bundle of cloth. She explained that she was to deliver this to me. Not knowing what it might be I was almost excited to pull the cloth away. Wrapped in the cloth was a beautiful, magnificent weapon. A longsword whose blade danced with lightning. A blessing from the Dark Queen herself. The blade felt like it was an extension of my arm , a part of me. There was more though. The Dark Queen was to be told of my progress with my sister. I explained where things were and made a simple request. I asked that once the breaking was complete that my sister was to be trained to become a Priestess of the Dark Queen. I also asked that she be placed at the Keep where I was staying so that I may keep an eye upon here. After those brief moments the Priestess also stated that she was to stay the evening at my pleasure. Though there seems to be no need to write the details of this encounter. I have worked hard and demanded much of myself since my first day in the Dragonarmy. I have earned everything I have been given. Finally it all paid off as I have attained the position of Highlord over the Blue Dragon Army. The time is now for me to begin to realize the dreams I have had for so long. To be the man my pathetic excuse of a father could never be. So much work... I spend most of my days talking with people and reading over reports. Dealing with many small things that I never thought about. This is my new life and one I am enjoying actually. I do miss the daily walks to find someone that opposes me and to remove their heads. Or the slaughter of the crazed minotaurs and ogres. How I do love the blood of battle but I have learned that there is much more to this life of power than killing things that stand in your way. The Highlord has Risen and with that the world will tremble. The past several days have been perhaps the hardest of my life. I went to the Dragon Queen asking for a favor. One to show my complete loyalty to her and at the same time something that would increase my personal power. I won't deny I asked for this favor for some personal gain and not just out of loyalty. I asked the Dark Queen to grant me life as a half dragon. This was obviously not something she took lightly. I was given the orders to find a Silver Dragon and obtain a vial of its blood. I had battled a dragon once before by had the Empress at my side. This time I would be facing one alone. The Dark Queen did provide me with a most unique weapon I must admit. For several days I roamed the lands in search of the elusive Silver Dragon. I traveled to the lands of Solamnia where I knew I would more than likely be attacked on sight if I was recognized. I emerged from a patch of woods and there she stood. Oh so very beautiful. The sun glistening off her scales. Without a thought, which was my error, I charged. The fight was a short one and not in a good way. I don't remember much other than the dragon throwing me quite a distance. I crashed to the ground, barely alive. The Lance was gone. It was my greatest failure. I had lost the Weapon of the Dark Queen. After the battle with the Silver Dragon I walked along the road not caring who saw me. My mind was clouded with the thoughts of how I would tell my Queen I had failed and lost the Lance. I heard several men approaching and turned to face them. A group of Solamnic Knights decided they wished to arrest me. Battered and beaten I almost let them take me but what kind of man would I be if I just gave in. I'd be just like my father. I raised my sword, one by one the Knights fell in a pool of their own blood at my feat. Now they understood. I proceeded to remove each man's heads or at least I was in the process of doing so when a young lady approached. Obviously not sure of what happened she began to try to bandage and heal the wounded, though dead, men. It came as a bit of a shock that she seemed to be unaware that I was the one who had done this to these men. Maybe the sight of the carnage made her act in a way she normally wouldn't. As she was bent over attending to one of the men I struck a blow. Not to kill, no, she was much more useful alive. The idiots would try to rescue her and in the process he would find a way to turn this into getting the Lance back. I moved swiftly to face my Queen for I believed she would be even more harsh upon me if I avoided reporting to her of what happened. I honestly did not expect to be making this entry. I was certain my death would be coming as a result of my failure and for losing the precious weapon. I lay the prize in front of my Queen first hoping that it would deflect some of the anger that would soon follow. I explained how everything had happened and how I had come about capturing the young lady. I told her of my plans to use her as a pawn to get the Lance returned. Her anger was apparent as soon as I told her of what had happened. I'll never forget the pain of the her striking me. She hit me once and I fell to my knees. The pain was unlike any I had ever experienced. If she wanted me dead, that blow could have easily done it. As I lay there in my pool of blood I could barely understand what she was shouting at me but the point was very clear. Get the Lance back and do it quickly. The Commander knocked on my door. He asked to speak to me freely , without worry of any harm coming to him for what he was going to tell me. He explained to me that I had fallen out of the Blue Dragon's favor. That they had gone behind my back to speak with the Queen and to arrange a deal with the Silver Dragon that I would meet him on the field of battle. They were also unhappy with my threats to slaughter the young Cleric if my demands were not met for the Lance to be returned. I was being to brutal he said. I wasn't showing honor he said. What does he know about leading a entire army? or running occupied areas that should be handle by those I trust yet I haven't found any that I trust enough? Could he even imagine the wrath I would feel from the Queen if I were to fail her in getting the Lance back. Action was needed. I may not be the most honorable or the most diplomatic man but I get results. I always have. I met with the Empress before heading out to find the Silver Dragon once again. To meet it on the battle field a second time. What other choice did I have? My honor was being questioned. I had fallen out of favor with the Queen according to the Commander. I had to do this to fix it all or die trying. I stood mere feet from it. The Dragon decided it wanted to talk but I mocked him. Trying to bait it into making some kind of mistake, to leave some kind of opening. I had many blessing cast upon me, granted by my Queen and the Empress. I felt a warmth come about me. Maybe I had not fallen out of favor with my Queen. The battle raged on. I matched the power of the dragon with a fury that will be told of for the ages. Over and over my sword crashed against the scales of the dragon. Both the dragon and I were close to death and I feel to one knee. I looked up to see the Dragon actually stumble a bit. 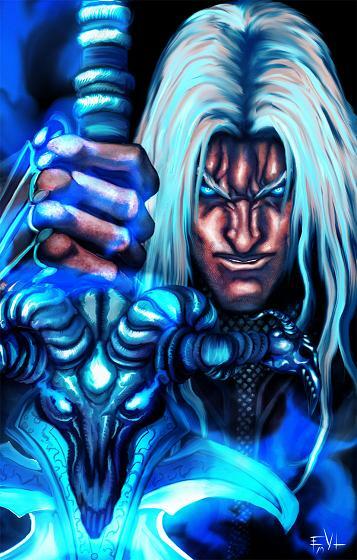 The opening he had waited for was there but Kain did not raise his weapon just as the Dragon had not taken that moment to deliver the final blow. I could have used a magical potion to heal myself but this fight was about honor as much as anything. Using a magical potion is not , in my opinion, an honorable act. The Dragon talked of his respect while I just stayed on one knee to weak to push myself to stand.. Then the Dragon proposed that we exchange the Cleric for the Lance. Let us both live to see another day. Another day that would lead to another battle between the two of us again I was sure. While I didn't want to agree to this, it was obviously the best I could make of the situation. After the dragon left I quickly collected a vial of its blood. Just as my Queen had asked. The Lance was going home to the Queen..It also had come of light during a talk with the Empress that the Commander had spoken of rumors and not facts. He will be dealt with. I finally am moving about after several days of lying around in bed. Not a very effective way to lead I will admit but I needed my rest after the experience I had recently. Life changing doesn't even begin to explain it. As I have mentioned previously I desired to have my body transformed and to become a Half Dragon. To show my loyalty to the Dark Queen and to the Blue Dragons. I had acquired what was needed. Now it was time for the ritual. Most of it is a blur so I can not tell you what happened. I remember the Dark Queen approaching me and without any warning she slammed her fist into my chest, ripping through my plated armor, bone.. whatever else protected the way to my heart. There she did something and I felt a burning sensation through out my body. Amazingly I did not die or even pass out when she did this. Though I must admit part of me wishes I would have at least passed out. The burning I felt was her infusing the silver dragons blood into my own. Some changes have happened to me since that day. Obviously I now have a large scar that crosses a good portion of my torso. I wear it with pride. My hair has turned a shade of light blue which is a bit unsettling but I think I will learn to like it. Things are definitely looking positive for me and the Blue Dragon Army.